Nice to see that Dwayne Johnson, 41, can laugh at himself. He posted this highly entertaining photo of him as a young man in the 90’s online and we barely recognized him. 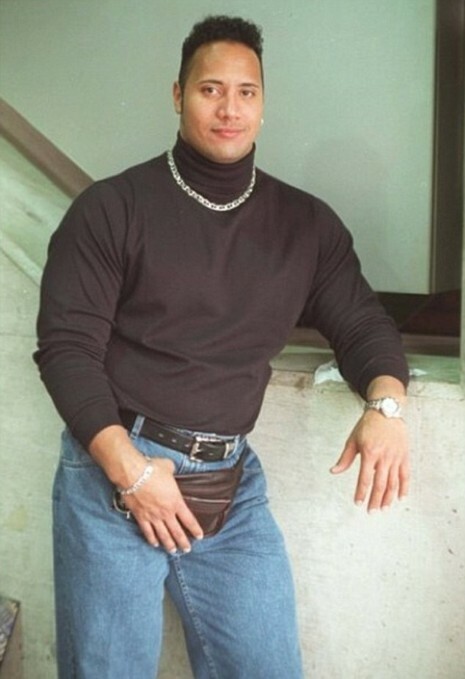 He captioned it “Fanny pack and lean take it to a whole other level” – he compared himself to a “buff lesbian.” Yikes- themom jeans and fanny pack, not to mention the necklace and hairdo, indicate how FAR The Rock has come since then – now he’s HERCULES!